Customized mouth pieces are sometimes suitable for people with sleep apnea and to also treat snoring. These mouth pieces may be appropriate for patients with mild to moderate obstructed sleep apnea, according to the American Sleep Association, and they can be a good alternative for patients who cannot tolerate a CPAP machine. The right mouth piece can greatly reduce snoring by creating an unobstructed airway within the mouth. This can improve sleep for both you and your partner. At first glance, this mouth piece appears similar to a pacifier. It works by pulling the tongue forward while sleeping and is approved by the FDA. The Good Morning Snore Solution is not custom fitted but is instead considered one-size-fits-all. This product features a 30-day money-back guarantee. Priced around $100, this is not the least expensive option available, but it is certainly less expensive than a custom-fitted device from a medical professional. Reviews on the product's website are largely positive, with the chief complaint appearing to be an increase in drool while sleeping; this is typical of most oral devices when first using. A reviewer at Top Snoring Mouthpieces praises this product for its simplicity of use and efficacy. Snoring HQ reviewed this product and declared it comfortable and effective. They warn that tongue soreness is a possibility at first use, and for some, the soreness does not subside. Snoring Mouthpiece Review says this is the best product available for everyone except those who breathe through their mouths at night, as users must rely on nose breathing while using the Good Morning Snore Solution. This mouth piece is a mandibular repositioning appliance which holds the jaw in place to open the airways and prevent snoring. The ZQuiet was originally designed by a dentist and is unique to this type of mouth piece since it allows the user to sleep with mouth opened or closed. Priced around $80, it comes with a 30-day money-back guarantee and is FDA approved. Snorezing's review of the ZQuiet is largely positive since the reviewer was able to get a snore-free sleep the first night of use. Snoring HQ declares ZQuiet as "better than most" and praises the hinge that allows for mouth movement during wear. His own experience with the product was positive, and he reported no snoring the first night of use. His wife also tried the product and experienced decreased snoring and both reported better overall sleep. The reviewer at Top Snoring Mouthpieces said he didn't snore the first night of use and was surprised a mouth piece that isn't customized could offer such results. He did mention jaw soreness, which is characteristic of most mandibular repositioning appliances. Snoring Mouthpiece Review calls the ZQuiet a "win for mouth breathers." The reviewer also said he found the appliance to be surprisingly comfortable and said his snoring was reduced with the first use. 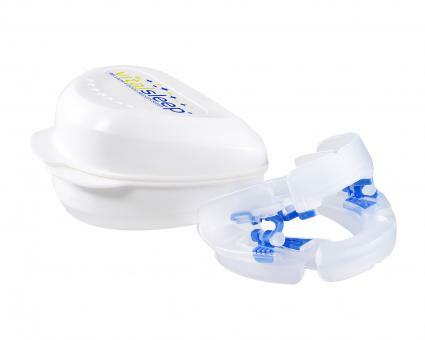 VitalSleep is an FDA-cleared mouth piece to treat the snoring that accompanies mild to moderate sleep apnea. It works by holding the jaw in place to allow optimal breathing while sleeping. Priced around $80, this mouth piece is adjustable and available in two sizes: small and large. VitalSleep offers a 30-day money-back guarantee and a 12-month replacement warranty. Customer testimonials on the VitalSleep website praise the product for stopping or reducing snoring, allowing the users and their partners to get a good night's sleep. Snorezing's review explained that when this device works, it works quite effectively, yet it will not work for everyone. While it's an effective device for stopping snoring, it is not marketed as a sleep apnea solution but instead is intended to stop the snoring that accompanies mild to moderate sleep apnea. Uplifting Mobility includes VitalSleep among its list of Best Sleep Apnea Mouth Guards, citing it as a good option for people with mild sleep apnea who prefer to not use a CPAP machine. The American Sleep Association said VitalSleep is comfortable and easy to use and has a longer life of around two years when compared to other mouth pieces. They praise the adjustable design that allows users to find the best fit. A mouth piece is designed to fit into the mouth and prevent the soft tissue and tongue from blocking the air passages. Mandibular repositioning appliances and tongue retainer or stabilizer mouth pieces both work to open airways and have been shown in a study to be similar in effectiveness in treating mild to moderate sleep apnea. With more than 100 mouthpiece designs approved by the FDA, there are plenty of options from which to choose. Select one made specifically for sleep apnea, noting that there are many mouth pieces available for teeth grinding, but these will likely not provide the relief necessary to be effective for sleep apnea. A doctor, dentist, or sleep specialist can recommend the best mouth piece based on a patient's needs and sleep apnea severity. Visiting the dentist and having a custom mouth piece created for you in the office has myriad benefits, although it's usually the most expensive route overall. Luckily, insurance (health, not dental) may cover most or all of the cost, especially if the mouth piece is deemed medically necessary by your medical professional. The total cost for a customized sleep apnea mouth piece from the dentist can easily reach $2,000 or $3,000 when initial exams and follow-ups are included, so it's important to understand the costs and what insurance will cover before starting the process. The American Sleep Association endorses appropriate mouth pieces to help treat mild to moderate sleep apnea, stating these products will likely gain more popularity in coming years, perhaps even featuring usage tracking technology in the future similarly to some CPAP machines. It's important to note these mouth pieces are appropriate for obstructed sleep apnea and not for central sleep apnea; speak with a medical professional for more details.